The abandoned cottage is a common sight in Ireland. Many are the result of the Great Famine (1846-52) when starvation and emigration devastated a quarter of the population. 1 million people died from starvation and another million emigrated. When we think of famine we picture arid, parched landscapes as we see in Africa today. This is a rich, lush land and these cottages are a reminder of what can happen as a consequence political mismanagement. In the final painting there is very little red but its there as part of each of the mixes. The blues are made more purple and the yellows are more orange. The result is a vibrant clash of colour. Notice also the use of diagonals in the basic structure in the composition. There is feverous activity in preparation for the harvest – not a quiet time in the fields. The colours used are Cadmium Yellow, Permanent Rose, Raw Umber, French Ultramarine plus black and white. All colours, except Cadmium Yellow, are Alkyd fast drying oils. At this time of year they are a little too fast and parts of the sky had begun to ‘set’ before I was finished. Not good for the sky part but great for overpainting the trees onto the wet sky. Daybreak, at this time of the year, is not a familiar sight. After all, its currently 5.30am and a month ago it was 4.30am. Unless you’re a night worker or insomniac, you will miss this natural spectacle. The colours are different from the orange reds of sunset and tend to be more pinks and purples. The colour I find best for these pink shades is Alizarin Crimson. Its transparent and a reasonably good mixer with the other colours I use. In this morning sky there were pink and lemon colours. The yellow used was Cadmium Yellow. The difficulty was using these two very strong colours closely together without producing the brilliant orange you normally get when these are mixed. Orange colours are the sunset colours not the cool morning light. Also the sky colours had to be the faintest hint of pink and yellow. Mixing these colours accurately at such low concentrations on the palette is difficult as its all relative to the colours in rest of the sky. I painted these two strong colours as raw unmixed solvent-only layers and allowed the solvent to evaporate. As I said previously, they were not allowed to mix as this would produce orange colours. Pure white was painted on top and the paint was blended some of the Cadmium and Crimson began to mix with the white. The depth of colour was controlled by the brushing process – the more it was brushed the more colour was picked up from underneath, the deeper the colour. As I said its relative to the other colours in the sky, so the entire sky was painted as a single item so the emerging colours were seen as part of the whole. Also notice that these two strong colours (Cadmium Yellow and Alizarin Crimson) were also spread over the entire painting surface. This was to unify the colour scheme and tie sky and ground together. The painting is 18″ x 13″ and was completed in a single 2 and a half hour session. The colours used were Cadmium Yellow, Raw Umber, Alizarin Crimson and French Ultramarine plus black and white. I did not use any medium only the solvent, White Spirits. Here’s the video, see you soon. 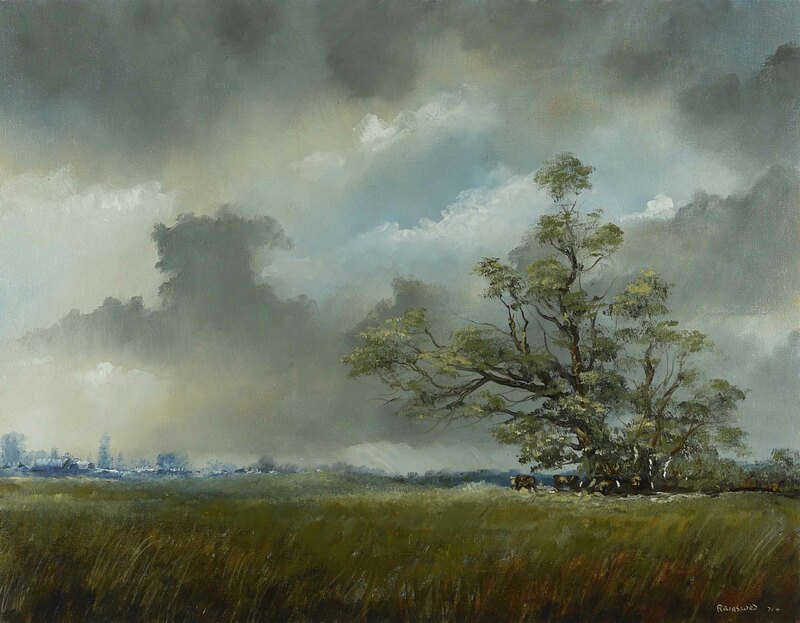 When you consider how much area a sky occupies in the average landscape painting, its strange why many landscape painters regard the sky as merely a backdrop to the subjects in their paintings. For me, the sky is an important part of the painting. It may have something to do with the fact that I live in a very flat landscape and here you can’t but notice the sky in its entirety. After a few woodland paintings, where the sky is also a backdrop, I needed to produce a sky. Whatever about the rest of the painting, a sky is definitely a work of the imagination. This should mean anything goes but not so. If the sky is in anyway ‘peculiar’ it upsets the entire painting. When I paint clouds I’m always watchful of the accidental ‘odd’ shape that can creep into a pattern and dominate the painting. You know what I mean, that wooly sheep, Homer Simson profile or prancing pony that you never noticed until its pointed out to you and you can’t understand why you didn’t see it before. The funny thing is that all these shapes are in the natural cloud world as any child will show you but are not acceptable in a painting. This painting has a dominant ‘grotesque’ cloud shape. But as I was painting it I was still conscious of the possibility of producing a shape which would have the viewer thinking about something else, other than a cloud. I think I’ve managed to produce such a shape but it was not easy. There was a lot of shaping and reshaping. The fact that its seen as deliberate and not a mistake makes it more acceptable. To strengthen this idea, the tree also has an unusual shape but the rest of the scene is mundane and normal. Recently I’ve been experimenting producing random patterns into otherwise normal landscapes. By using lots of solvent and allowing it to flow helps in this. For example, the trunk of a tree seems to look more natural if there is a pattern of random shapes produced by the flow of liquid. But as with cloud shapes, this can produce unwanted ‘peculiar’ results. The painting is 18″ x 14″ and has 3 colours, Yellow Ochre, Burnt Sienna and Cobalt Blue plus black and white. As usual I’ve used solvent only with no medium. I normally lay down layers of raw colour with solvent only and use the transparency offered by these washes as part of the final painting. 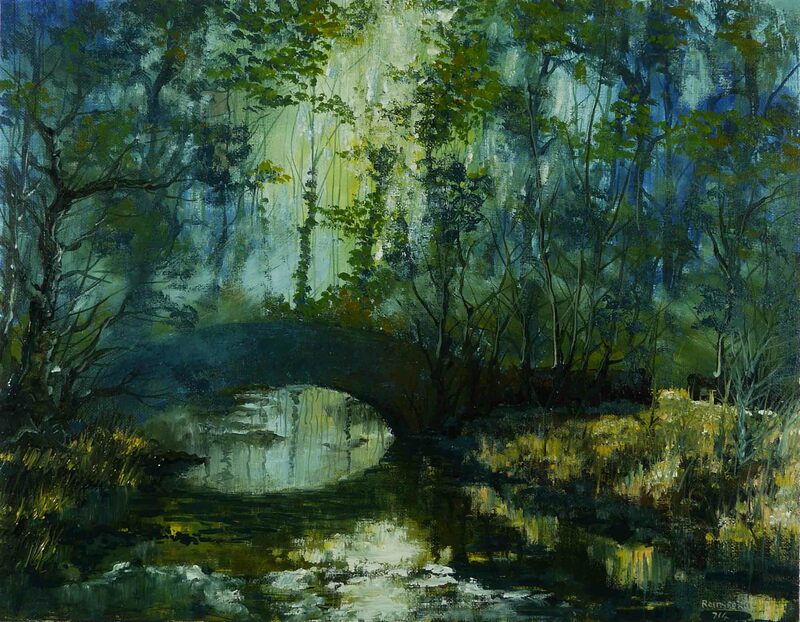 Rich shadows, onto which the final opaque colours are painted, can achieve the depth of colour as seen in the previous painting (here). This time I was interested in a bright, lightly coloured woodland scene. 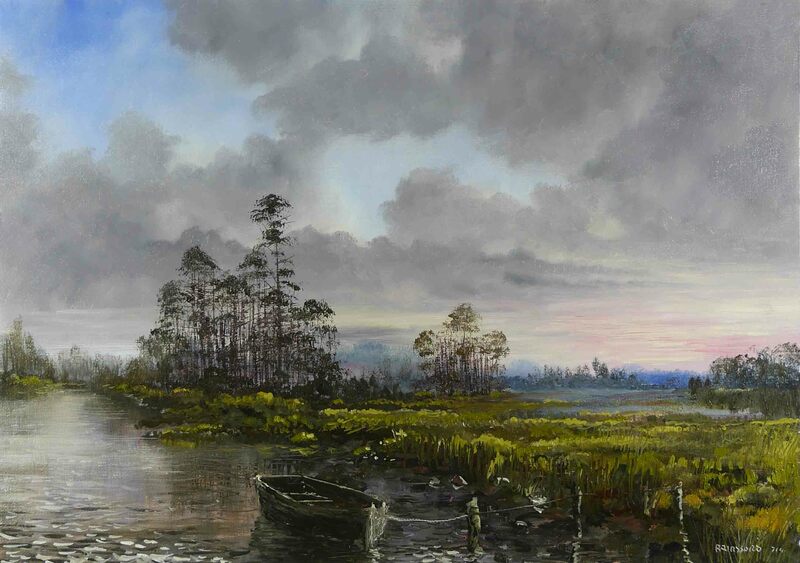 The initial colours were not the unmixed raw colour, as in previous painting, but an opaque light blue in the sky and a grey in the foreground. Solvent only was also the method of application and although the solvent evaporates quickly the paint layer will still be wet enough to mix with subsequent added paint layers. This can cause problems as the white will ‘muddy’ any attempts to paint rich shadows. So when painting the final colours I made them darker than normal and flooded the colour with loads of solvent. In some places the colour was unmixed and picked up the lighter under colour. This was OK for mid tones, but the deeper colours were dropped in as blobs of liquid paint. In this situation the liquid tends to fill the lines left by the previous brush strokes and you can get some nice random shapes. Remember the painting will dry very flat and disappointing and will definitely need ‘oiling out’ to restore the colour. The painting is 12″ x 9″ and the colours used were Cadmium Yellow, Burnt Sienna and Ultramarine Blue plus black and white. Back in the deep dark woods. We are coming to the end of a dry, hot few weeks and there is nothing like a canopy of trees to cool the air. 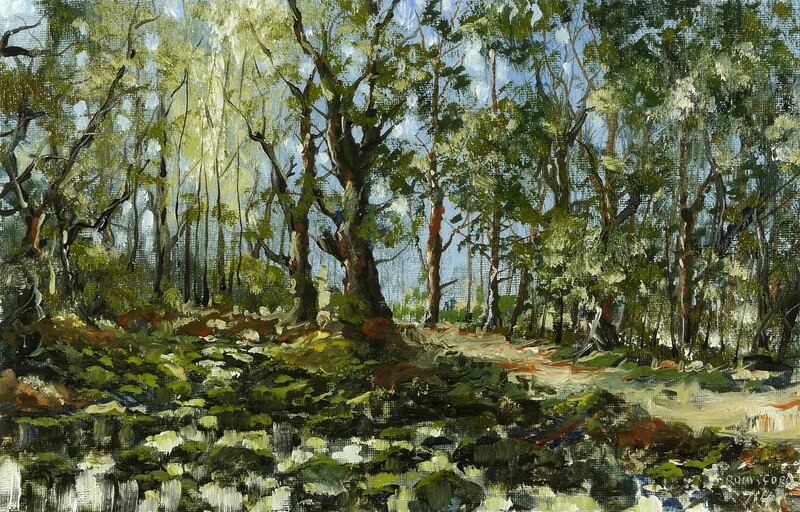 The effects of light in a landscape are difficult to represent in an oil painting. 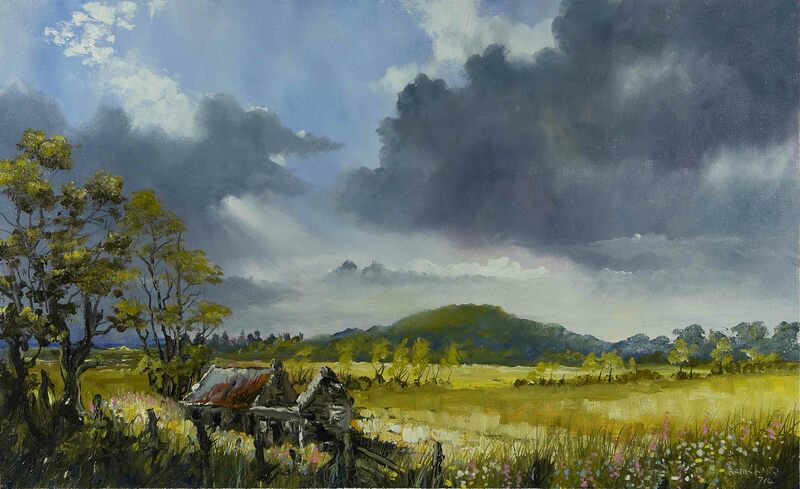 Watercolour and pastel are easier, each has its own qualities. Watercolour has transparency, great for glowing light, but once placed is difficult to manipulate without looking overworked. Pastels are all about smudging and blending but are completely opaque. In this painting, I’ve used transparency in a ‘watercolour’ way and also smudged and blended as in a ‘pastel’. The flexibility of oil painting allows a painting to be produced in this way. I have used both watercolour and pastel and even tried mixing the media in a painting but the results were not great. As usual I’ve used only 3 colours, Cadmium Yellow, Burnt Sienna and Prussian Blue and as usual I have not used any medium. There was a lot of solvent used to produce thin washes, similar to watercolour and some paint was used with no thinning to blend and produce the effects of mist. The opaque highlights were painted sometimes with the ‘wash’ of colour and other times as a ‘dry’ daub.